Last night was a historic night in my football life. At approximately 9:45 p.m. I sat on my sofa and proclaimed; "I agree with Souness". After picking myself back up off the floor, dusting myself down and checking my drink hadn't been spiked I rewound Sky's coverage. "I'm in disbelief..........I find it incredible that someone with half an hour to go a player wouldn't want to go on an help his team mates out. How selfish can you get? How petulant can you be?" "You would chase him as far from Manchester as you could tomorrow, he...he is one bad apple"
"He is a disgrace to football. The man in the street thinks there is a lot wrong with your modern footballer. He epitomises what the man in the street thinks about modern footballers." Meanwhile Dwight Yorke and Mark Hughes seeemed desperate to find an angle that would allow them to provide an alternative view and defend Tevez, their views visibly riling an already irked Souness. Sad to say that the fact Hughes shares an agent with Tevez (Kia Joorabchanian) might have somewhat softened his opinion. Some of you may say that "you're a Blade, you are bound to have it in for Tevez!". To that I would say, that I don't have a problem with Tevez personally. My issues remain with the the Premier League's handling of the Tevez situation, the confused conclusion of the first enquiry which took West Ham fans' feelings into account and the West Ham administrators who the commission found had told direct lies about the disclosure of documentation relating to Tevez's registration. I certainly wouldn't want those people anywhere near my club, would you? This morning Tevez has issued a statement saying that "There was some confusion on the bench and I believe my position may have been misunderstood." This was a suggestion made by Mark Hughes on Sky last night and a ridiculous one at that. Tevez appeared to be given Mancini's mesage by a translator, a message that he has been given several times this season already. What is there to misunderstand? Unless Carlos' translator is going to be a scapegoat in all this. Tevez's statement goes on to say; "They understand that when I am on the pitch I have always given my best for the club. In Munich on Tuesday I had warmed up and was ready to play. This is not the right time to get into specific details as to why this did not happen. But I wish to state that I never refused to play. Going forward I am ready to play when required and to fulfil my obligations." "Tevez chatting to Zabaleta on (the) plane. Doesn't look exactly chastened by the events of this evening." Unsurprisingly, PFA chief Gordon Taylor attempted to defend Tevez on 5 Live this morning, even partially blaming Mancini saying that relations between the two had reached a dire position even prior to last night. Taylor displaying the traits increasingly shown by union leaders who earn more money than a majority of their members and appear to think they can defend the indefensible, without fear of reproach or criticism. But that is a rant for another day. Many have said that the next steps are that Tevez will probably be fined two week's wages, he could be sacked (maybe this is what he is angling for - allowing him to potentially move closer to family, or Internazionale) and almost certainly he will never play for City again. Yet I think there is something else that City can do. Although much maligned for their financial largesse and their ability to outbid most teams for any player, some even said they have brought these problems on themselves by signing so many quality players that they cannot satisfy, City are in an enviable position to make a statement for the good of football. They don't need the money that Tevez's transfer might generate. In fact, if they wanted to maximise their return they might have sold him in the Summer. So why not keep him and let him sit in the stand for the rest of his contract? No doubt Gordon Taylor and Tevez's advisers would claim a restraint of trade, yet Tevez demonstrated a level of personal restraint last night that surely nullifies such claims, however contrite he is now. Last night, Carlos Tevez took the piss out of his manager, his club and the fans that pay the money that will help fund his not inconsiderate wages. He should be made to pay the ultimate price. 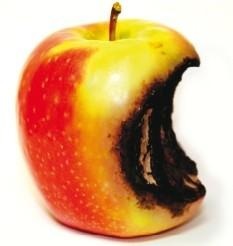 Let the bad apple go rot! Play him week in and week out in the reserves.. grind him down.